Momentum Classic is a completely automatic trading EA. It is a fact that market is mostly trading in range and high-power bursts are rare. These sharp movements are starting with momentum, which is a signal to trend start, increased volatility and trading volumes. We built a special algo, which seeks for such Impulse (Momentum), to signal trade entry. 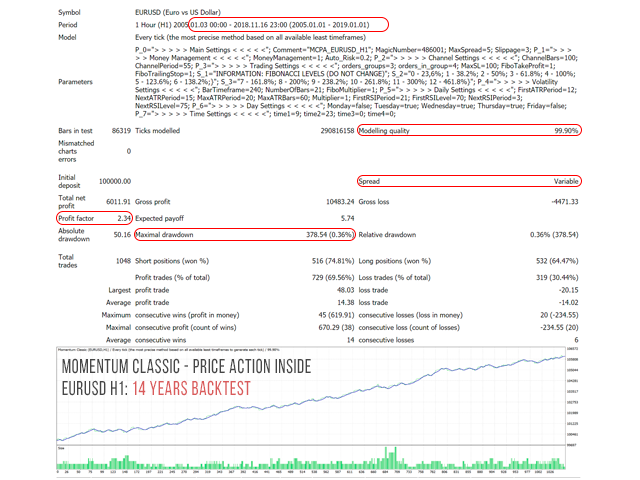 Momentum Classic also has several filters, based on deviation from standard market volatility, so the EA can tell noise from the real trend emerging. 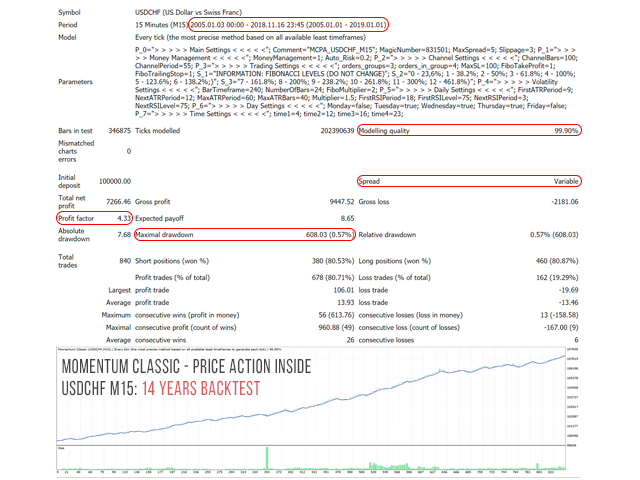 Momentum Classic is built on the Price Action principles and is measuring strength of Momentum not only by deviation from standard volatility, but also using technical indicator like RSI and ATR. Momentum Classic is a long-term investment strategy. EA can trade on any kind of broker account (ECN, STP or other) and it is not dependent on spread size, commission or slippage and provides highly stable trading performance. Comment - prefix for comments to trades. Fixed Lot - fixed lot size (not recommended, since the SL value is floating). Risk Level - risk level. Money Management - risk per trade. Supported Currency Pairs - supported currency pairs. M15 - currency pairs supported on М15 (AUDUSD;EURAUD;EURGBP;EURJPY;EURUSD;GBPJPY;GBPUSD;USDCHF;USDJPY;XAUUSD). М30 - currency pairs supported on М30 (AUDUSD;EURAUD;EURGBP;EURJPY;EURUSD;GBPJPY;GBPUSD;USDCHF;USDJPY;XAUUSD). Н1 - currency pairs supported on Н1 (AUDUSD;EURAUD;EURGBP;EURJPY;EURUSD;GBPJPY;GBPUSD;USDCHF;USDJPY;XAUUSD). One Chart Mode - activate the One Chart Mode (trade all pairs from one chart on the specified timeframe). Symbol Prefix - prefix of the traded pair (for example: "pro. ", if the name of the pair is "pro.EURUSD"). Symbol Suffix - suffix of the traded pair (for example: ".pro", if the name of the pair is "EURUSD.pro"). Great price action EA. I purchased EA 2 months ago and I was selective about trades and charts to run EA on. Now I am very excited about one chart mode. Thank you Ivan Potcha for making one chart mode available to original EA. It picks some really nice trades overall. Unfortunately it picks some late entries most of the time, causing price to reverse on you quite often. That said, I started using it semi-automatically. I let the EA pick the entries and I close the trades manually whenever I start feeling uncomfortable with the length of the breakout. Running it completely automatic might not be a bad idea however. Check the live signal. It seems to do alright on its own. I just think manually closing trades while they are in profit is a better strategy. This EA has a very well thought out concept for Long Term Trading; it's a system without any dangerous methods which is a very important fact for the longterm using of an EA. From this point of view it's a perfect investment for everybody who understand that trading is a hard business and not a ''get rich within one year'' game! For experienced traders as well as for inexperienced as Ivan is very helpful for solving problems! Clear recommendation for this Expert Advisor! I have been looking for a long time an flexible longterm system! 100+ stars! Great, it's a first Impulse system here, which is working! More then $500 profit in a 1 week! Wow, it's looking grandiose, it's someting "different" from other EAs FINALLY and awesome! I am using a lot of PA systems from market, but last year they have so bad performance. Momentum Classic looking much more stable and interesting. And it's available for optimization! 3. Ivan is a professional author, who have been recommended by a lot of a high-quality products for a long period! So 5 stars, I am onboard!